Runbow is a great game. It’s simple in concept, clean in execution, and raucously fun in groups. 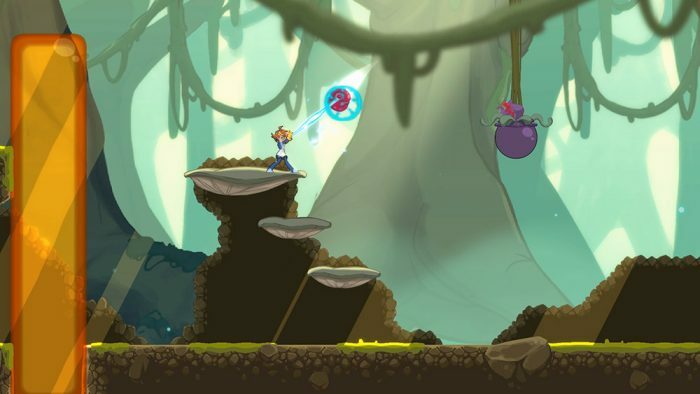 Developer 13AM Games enjoyed success with the project, and with their smaller follow-up Pirate Pop Plus, but knew that a larger endeavor would have to be just as unique to continue their momentum. With Double Cross, their next game, they’re taking the experiences they’ve acquired and mixing in ideas they’ve been passionate about to create an interesting action-adventure-investigation hybrid. At PAX earlier this month, the game was on display for us to try out its interesting mix of genres. 13AM have always wanted to make a game with an interesting plot to move it along. In DoubleCross they brought that to the forefront. In it, we take control of the dimension-hopping protagonist Zahra, and our goal is discover why the organization we work for, RIFT, is mysteriously coming under attack. We accomplish this in two ways: through action heavy sidescrolling stages, and through adventure game based detective work. This mix takes place in two different ways. In the hub world of RIFT’s HQ, we run around and interact with NPCs, asking questions and discovering secrets and tasks through conversations in hopes that we’ll unravel the mystery. 13AM has a knack for the bizarre and weird, and so we may bump into characters and situations that feel like they’re straight out of the early 90s Nickelodeon. In one, I come across a giant bodybuilding flower named Sprout, who’s worked out so much that he’s grown too big for the doorway leading out the gym. He’s stuck and growing depressed. As we come across cases like this, this information is added into our in-game notebooks for use later. If we gather enough info, we’re able to start to help the characters and figure out the greater puzzle in the process. It’s reminiscent of the elementary school riddles in which we had to determine who lives in what house. Hint: Mr Blue always lived in the blue house. The conversations themselves are designed much like modern adventure games, in which we’re presented with positive and negative choices that may lead to specific responses and clues. We’re also given the choice to “connect,” which lets us bring out an item or bit of evidence gained elsewhere to help propel the plot forward. Once we’ve gathered up all the info we need, portals within RIFT will open to other worlds. These worlds are where we jump (literally) into the action portion of the game. Starting in the training area, we learn to use the Proton Slinger, DoubleCross’s gameplay mechanism of choice, that acts sort of like a grappling hook on steroids. The tool lets us jump around levels, aiming and sling in any direction to grab onto specific points. When we hold down the button, time seems to slow down a little bit to let us aim better. Even if we’re not great at doing it, the game makes up for it with a generous lock-on area. The tool also lets us grab objects and enemies, launching them in any direction we please. That’s the only “weapon” that the game utilizes, if you call it that. Most of our interaction with enemies and the world is through melee attacks. 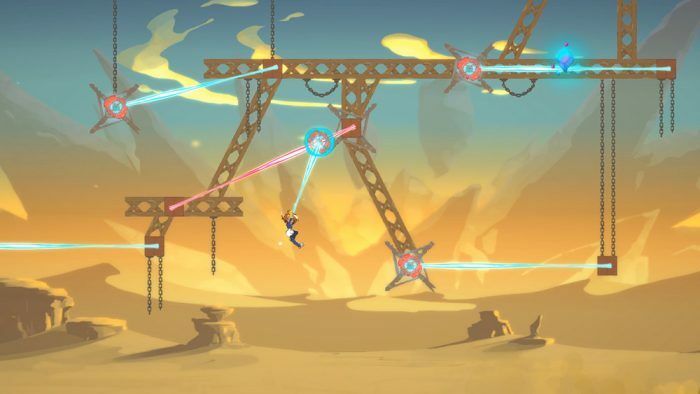 This is built on the DNA from Runbow, with punches and combos, uppercuts and jumps taking down bad guys. These attacks build up a meter over time that can be used to unleash special attacks or fuel for healing (by holding the dodge button), making meter management an important part of our awareness. Double Cross does an interesting thing with skills and upgrades. By finding enough shards of Upgradium (yes, that’s the name) through the stages, we adjust and improve our skills via a lite RPG system. Certain unlocks are permanent, in that when we get a specific type of combo we’ll always have it. Others, however, offset in activation. If we want double attack power, for example, we’ll need to reduce our HP by half. The same goes with other aspects like speed and defense and jumping heights, etc. They’re varied enough that it lets (and sort of forces) players fiddle with their character skillset to fit their exact style of play. And, because we can swap these at checkpoints, we can change our setup based on the in-game situation we come across. The game has three main worlds (alternate versions of Earth) with three large stages in each, playable in any order and as often as we want. 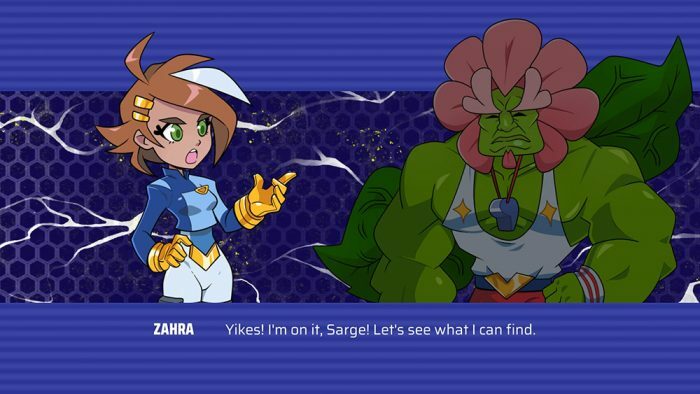 It’s a bit like Mega Man suddenly became a Metroidvania with a plot. Our hands-on with the demo focuses on one level in the Gootopia dimension. As I hop along platforms, amoeba-like monsters attack me and traps try to swallow me. The levels aren’t linear, either, meaning that I can go in any direction, grappling to ledges going forward or up to secret areas and challenge rooms for prizes. Some of the stages will be full-on action, while others are more puzzle-based, offering even more diversity than the genre mix that the game is already offering up. This could influence what skills we equip. By the time I make it to the end of the stage, I manage to find an item that I can give to an NPC later in the RIFT. I’m also shown which Upgradium I may have missed along the way and how my time ranks against the rest of the world (or, it *will* once the game releases). This is an added bonus for those of us who like to speedrun through games, as we can always check ourselves against others. With any platforming game, the controls are the most important part. Here they feel good, but with a reliance on a grappling/melee mix the game definitely has a learning curve; it takes a little while to get the initial mechanics down at the this stage of the build. 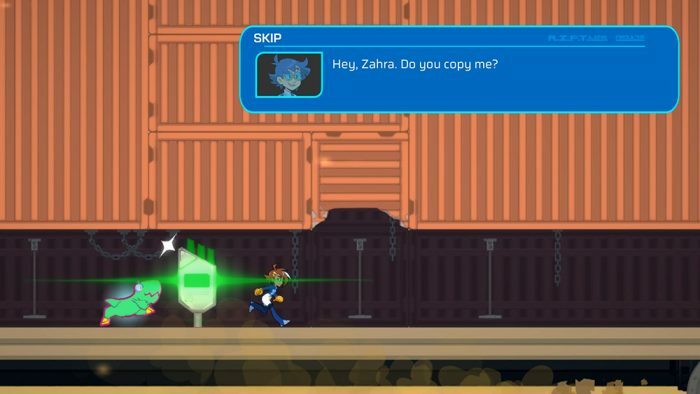 Double Cross is trying to be something very different from Runbow. It’s still built on speed and motion, but now it’s focusing on a larger overall experience. If 13AM can manage the balance between the action and adventure genres, and continue to emphasize the articulate controls, then it may have a real shot at being a unique and interesting experience. Double Cross releases later this year on Switch & PC.